Kids’ food brand Kiddylicious needed to create a series of social media clips for their #wafermoment campaign. These would go onto their Facebook, Twitter and Instagram pages, and would consist of a number of short, dialogue-free videos which each highlighted one of the ways that you can have a “#wafermoment”. We put together a number of scenarios, which were more a wish-list than a definitive shot list: we knew that the children we would be using were between 6 months and a year old, so we knew we wouldn’t be able to direct them in the normal way. Kiddylicious sourced appropriate parents from their Facebook page, who each sent in a short audition video clip, and we chose a small selection from this list. 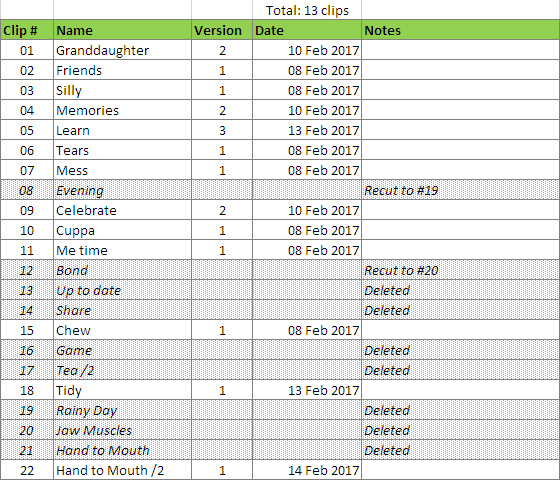 As clips were changed, moved about or recut into new versions, the spreadsheet was updated each time. We were rigorous about keeping things consistent, so that (for example) when the messaging changed, this would become a new clip with a new ID number. This meant that clips didn’t get “lost” and trigger later questions like, “What happened to the Evening clip?” It also helped us not to repeat any footage, because often we were creating a clip out of a spare piece of footage which had been intended to be something else, but the baby had done something particularly cute or noteworthy. Kiddylicious finally selected 13 clips, which were given a consistent look and feel throughout with a quick grade in Lumetri, and intro/outro graphics which we created and animated in Adobe After Effects.